Fisher ? ', 19', 33', ? 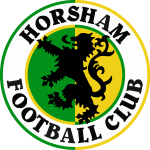 In a sensational match, Horsham conceded ten goals for the ﬁrst and only time in their County League history and thus recorded their worst league defeat since they lost 9-0 at Southwick in the 1930-31 season. It was a mere seven days since they had defeated Bognor 6-2 at Queen Street, and it marked most emphatically the end of the north Sussex club’s unbeaten league record. Horsham were playing a much-changed team, with Ray Mills replacing Stan Baker at left-back, George Hampshire ﬁlling in for Owen Parker at right-half, and M.Morgan replacing George Hampshire on the left wing. Jack Marriner skimmed the bar with an early, curling effort before Bognor began their onslaught on the Horsham goal. In the third minute Turner waltzed around the Horsham defenders before laying the ball off to Smith whose centre was headed in by Joe Dixon, and four minutes later a man was left unmarked at a throw-in despite Bob Hughes’ loud appeals for someone to take him on and the ball was quickly delivered to Turner who drove in hard. Fred Stenning failed to hold a long shot from the wing by Turner a minute later and Fisher made it 4-0 following a muddle in the goalmouth. In the nineteenth minute Turner’s shot rebounded from Stenning’s legs, enabling Fisher to net, and Fisher then delivered a not particularly hard shot from the edge of the penalty area which should have been easy to save, but Stenning dived over the top of it. Horsham were six goals down after just thirty minutes! There was bad luck for Horsham when a shot from Bill Simpson hit the underside of the bar, but the visitors were getting more into the game now and Den Daubney opened their account with a shot that went in off the inside of the post. A moment later and a Simpson effort was scrambled for a corner by Clinch and Ron Smallwood sent a left-footed shot curling just round the far post. Marriner finally reduced the arrears further from a free-kick to make it 6-2 at half-time. If Horsham were looking to close the gap even more immediately after the interval, they were disappointed when their hosts came out with renewed purpose and the Horsham defence appeared to be standing still when Fisher tapped the ball through a crowd of players to score a goal which seemed too easy to be real. Smallwood then began to drive the Horsham forward line harder and he tested Clinch with a hard shot and struck the post with the ‘keeper beaten a minute later. Though Horsham were now having the better of the play, Smith added Bognor’s eighth before Smallwood eventually found the net on sixty-five minutes and a Doug Potter-Daubney move finished with Simpson closing the gap further with a well-executed shot to make it 8-4. Daubney raised Horsham’s hopes higher when he jumped to head home a Smallwood corner and the travelling supporters were now in a frenzy as they sensed a momentous comeback with fifteen minutes still to play. Their hopes were cruelly dashed, however, as it was Bognor who renewed the offensive and added further goals through Smith and Randall before the ﬁnal whistle put Horsham out of their misery.